We’re going to grow your business together. That’s why we’ve set a competitive price list to match your needs and sector. Whether you’re a small or large online store, have a strong presence in marketplaces, or in other areas, or are just starting out, you’ll be satisfied with our services. BeezUP is independent of e-commerce channels (price comparison websites, marketplaces or others). BeezUP prices do not include the cost of listing products on these channels. BeezUP allows you to structure your data using entry, search and filtering support tools. Select products to publish by channel and customize data in detail. Whatever the size of your catalog, you can import it as often and in whatever format you wish and monitor your data at any time. Benefit from advanced statistics for optimal marketing decision-making. Automate unprofitable product deactivation based on your priority reports. Centralize and manage all marketplace orders and automatically synchronize your stocks. 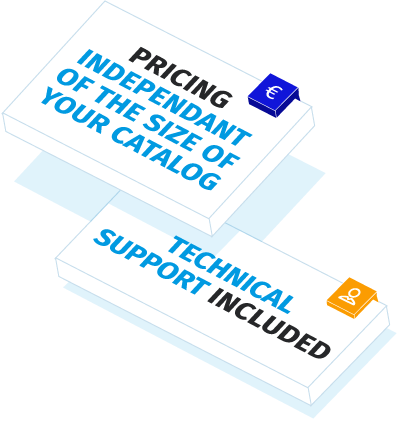 Discover our free modules (Magento/Prestashop modules and other e-commerce platforms) and our API to make integration easier. Do you have a specific request? Would you like to choose your offer with the help of one of our advisors? Get in touch!